Material: Leather, PP Leather, Rexine, Fabric, Leatherite. 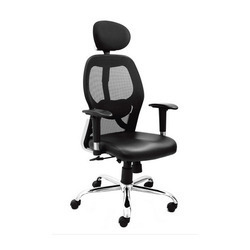 We offer variety of High Back Executive chairs, which are made from premium quality material. These chairs have been made while giving attention to each minute detail enabling them to have a regal look. These elegant looking chairs are highly suitable and appropriate for any executive cabin. We are looking queries for Delhi/NCR region. With a main aim to accomplish high level of patron trust, we have been engrossed in providing a vast assortment of High Back Executive Chair. 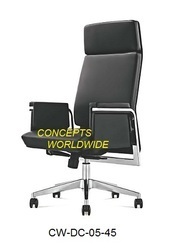 We are offering High Back Executive Chair. high back chair, Pu arms, chrome plated pipe frame and base, gas lift, seat and back leatherite tapestry. Our clients can avail from us a wide array of best quality Black Executive Chairs. The offered chairs can be availed from us in various sizes and pattern according to the need of clients. Highly acclaimed for its high load bearing capability and fine finishing, this product is offered at very reasonable rates.